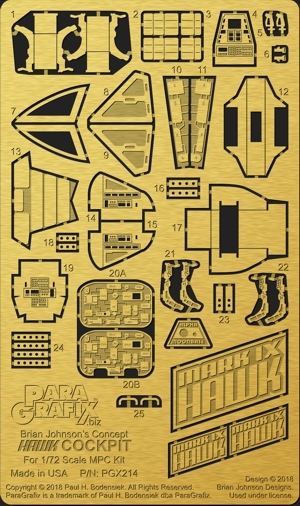 Famed British special affects artist Brian Johnson has shared his concept design for the Mark IX cockpit exclusively with ParaGrafix. This new photoetch set brings his concepts to life and adds an interior to the new Mark IX kit from MPC. The set includes a fully lightable* interior with seats, floor, walls, and more. Two separate rear walls enable the builder to run wires into the cockpit or not, depending on what is desired. The seats are designed to fit the pilot figures that come with Bandai's 1/72 scale Y-Wing fighter kit. Photos shown are of the prototype photoetch set.